Review of Great Divide Hercules Double IPA | Beer Apprentice - Craft Beer News, Reviews, Interviews and Info. Hello good people. For today’s craft beer review I’m going to drinking a Great Divide Hercules Double IPA produced by the Great Divide Brewing Company located in Denver, Colorado. Let’s jump right to the website, greatdivide.com, and find a description of this potent beer. HERCULES DOUBLE IPA is not for the faint of heart. It is, however, fit for the gods. HERCULES delivers a huge amount of hops from start to finish. Its hefty backbone of nutty, malty sweetness balances its aggressive hop profile. Sounds like a winner to me. This beer stands in at a sturdy 10.0% ABV and it comes in a 22 oz. bottle. The brew poured a clear, pale orange to copper/amber color. It had an eggshell colored head that was soft, creamy, fluffy and just a wee bit rocky. It had great size and some very, very nice retention going on. The lacing looked real good too. After the head finally settled it left a thin skim of foam on top of the liquid for the duration of the drink. It was a beautiful looking beer. The smell exhibited a wonderful citrus aroma. Hints of peach, mango and grapefruit. Additional tones of pine and maybe even a little bit of honey were noticed. It gave a nice jolt of caramel sugar also. Once the brew was allowed to warm a steady waft of toasted breadiness really helped to balanced the nose quite a bit. A real nice fragrance with this beer. The grapefruit citrus came on like gangbusters with the initial taste. Other tropical fruits were accounted for and significant amounts of bitterness could not be denied. It was rather resinous and oily also. Some pine and grassiness continued the hop profile and, like the aroma, some well needed, however robust, biscuity malt created a more harmonized flavor. Strong caramel candied flavors burst through a little more with each and every sip. A slight touch of alcohol was noticed, but it wasn’t near what I thought it might be. The mouthfeel was medium bodied. Dry, snappy, but smooth. Sticky, crisp and chewy. A small amount of warmth was left behind from the alcohol and more than enough flavor drenched the palate for enjoyment between sips. 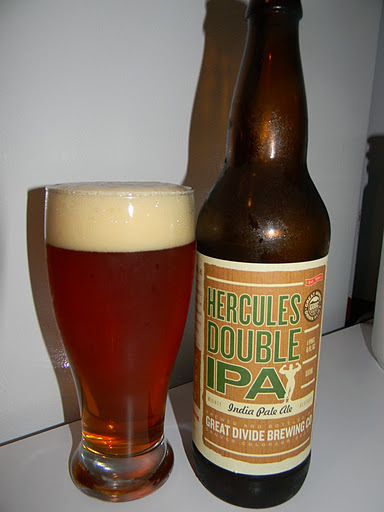 Great Divide has made a very good beer with the Hercules Double IPA. It’s big and bold in both the aroma and flavor and the appearance was exceptional also. It’s definitely worth a try if you can get it. The drinkability wasn’t bad either considering the 10.0% ABV. One bottle was plenty for me, but some of you guys may be able to handle two during one evening. One thing I did notice that could deter some was the fact that it did begin to get a little bit sweet as I neared the end of the bottle. Either way, I still liked the beer very much and would have no problem drinking this again if it were offered. Have you guys had the Great Divide Hercules Double IPA? What did you think of it? Be sure to leave a comment and let me know. Thanks for dropping by and reading another craft beer review guys. I really appreciate it.